From larger than life cabaret shows, to Las Vegas wedding chapels - if you’re interested in sneaking in a quick wedding ceremony, to cocktails and whiskey shots, stacks and stacks of casino chips, stars, lights and a groovy audio soundtrack, you can’t help but feel all the energy that Vegas has to offer. And of course all wins are highlighted by the numeral flashing neon lights. The party celebrations are certainly amped up in this Vegas, Baby online slot. The IGT powered Vegas Baby slot machine guarantees to deliver everything that the IGT brand stands for, IGT is a market leader that continually strives to push its own boundaries. They can claim this title due to the fact that their games are equipped with excellent graphics, the actual gaming experience is fast paced, and the themes that their games are based on are extremely popular. 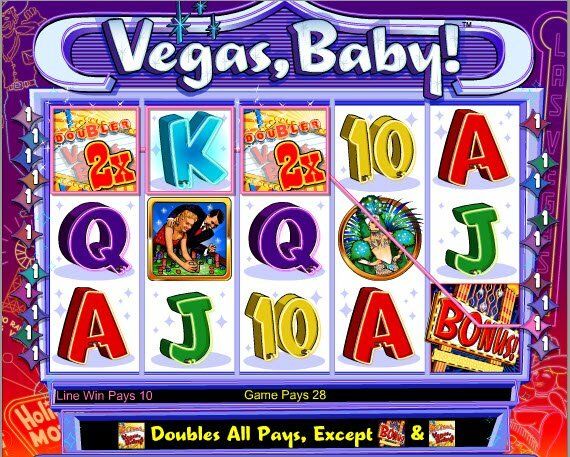 The audio and visual quality of games such as the Vegas Baby slot are of top class standards. 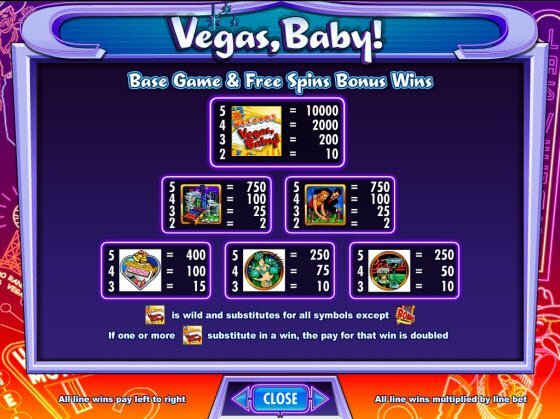 The Vegas Baby slot game is a 5 reel slot featuring 20 pay lines. 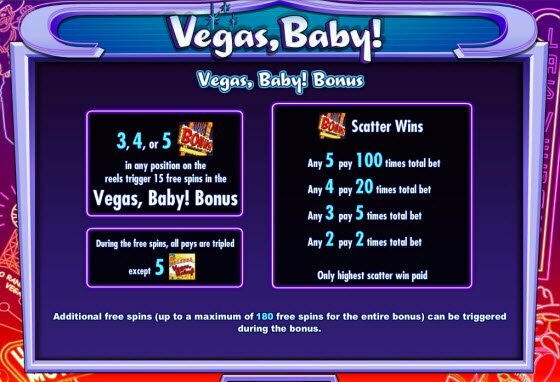 If you are lucky enough to receive 3, 4, 5 scatter symbols anywhere this will trigger the fortune free spins bonus Round. You will instantly receive 15 free spins and a 3x bonus multiplier. Get three or more bonus scatter symbols during the fortune free spin bonus round and receive an additional 15 free spins. Scatter symbols can retrigger the bonus round over and over for up to 180 free spins. Dont get impatient here you might need to stick around for a while as I didnt seem to trigger the free spins round very quickly. The welcome Vegas Baby symbol is the wild and substitutes for all symbols except the bonus symbol. One or more of these symbols will double any win they help create.